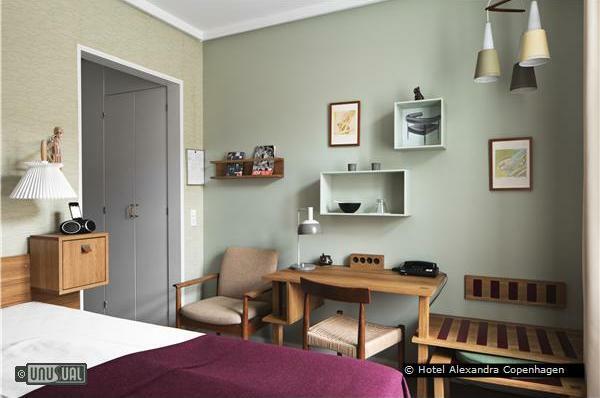 Hotel Alexandra has assembled a large collection of the world famous Danish mid-century vintage furniture and decorated the rooms with them. The rooms also have textiles, wallpapers and other gems that take you back in time to experience living like the design loving Danes did in the 50’s and 60’s. Hotel Alexandra is probably the only spot on Earth were you both can sit, rest, sleep and admire so many unique Danish design vintage classics. As soon as you step into the Hotel Alexandra, you step into a time bubble – you can relax in the lobby, where during evening hours you can put on your favourite vinyl record from the selection, enjoy a free glass of wine and take a closer look at one of the many designer books from the lobby library, all the while being surrounded by the finest Danish designer furniture. 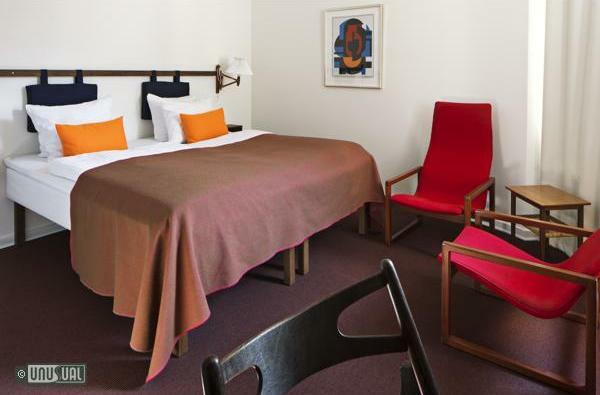 Hotel Alexandra has gradually collected a considerable amount of chairs from the period when Danish furniture design experienced its international breakthrough. This breakthrough was due to the dedication of architects and furniture designers in raising the standards of utility and craftsmanship. In the 1920’s, a handful of visionary pioneers renewed the Danish furniture tradition by continuing the useful elements from the past and by further developing function and comfort to such a degree that it resounded abroad, resulting in the success which made Denmark a leading furniture production country. Hotel Alexandra oozes of Danish design from the 50’s and 60’s - everything from the rooms to the hallways and the lobby. Experience this passion first hand and experience what it’s like, to be taken back into time, to where Danish design was at in its prime! 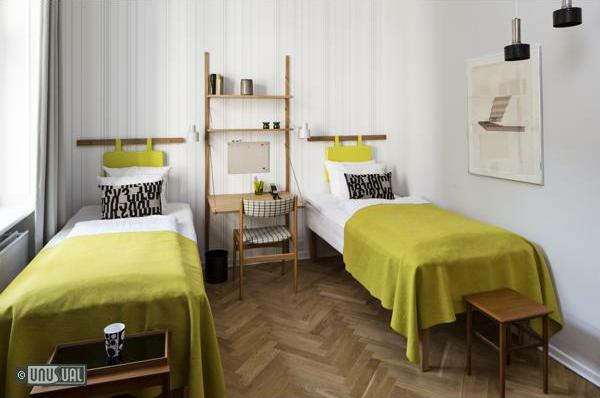 Hotel Alexandra is the only Danish retro design hotel in Copenhagen. 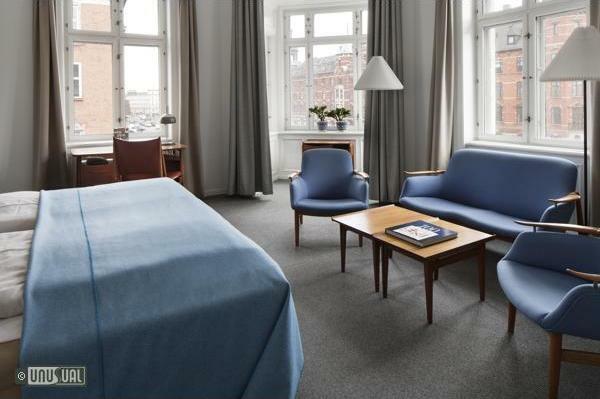 Hotel Alexandra represents the best of Danish hotel tradition. These traditions were created during the more than 100 years when the hotel was established in this historical building located in the heart of Copenhagen. Originally, this classical building was built as fashionable apartments. In 1910, Käthe and Theodor Hansen took over the hotel. Since then, the hotel has been developed and is now an inviting heaven in the city. Hotel Alexandra has its own unique atmosphere that unites proud old architectural and design traditions with modern facilities and convenience. A beautiful hotel, full of tradition, situated right in the heart of Copenhagen by the Town Hall Square and the Tivoli Gardens. 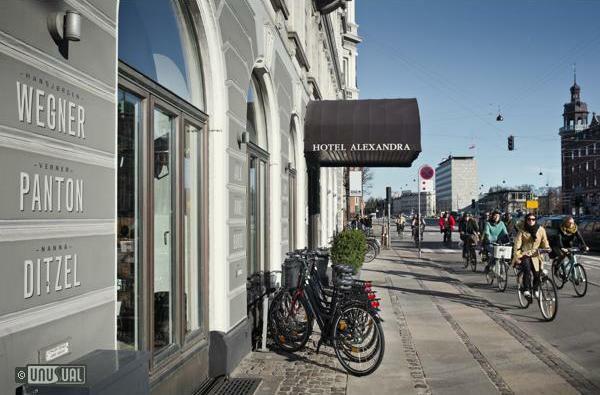 Although Hotel Alexandra is a modern hotel, you may still experience the old “Copenhagen ambience” due to a considerate restoration. You will find 61 charming rooms with all the modern facilities as well as elegant and classic Danish furniture. Furthermore, Hotel Alexandra has gained the Green Key. This is an environmental certificate awarded to hotels that pay special attention to the environment and to the health. Hotel Alexandra has a comfortable and functional lounge as well as a lovely and light restaurant with a well assorted breakfast, lunch and dinner. 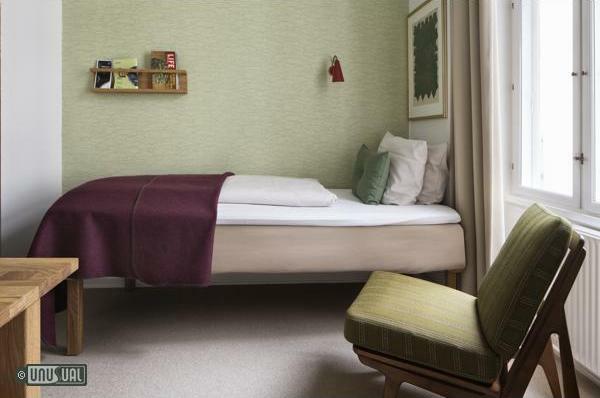 Small Danish Retro Rooms are approximately 11m2 with a single bed for one person. All of the single rooms overlook the courtyard, and are dedicated to either the 50’s or to the 60’s. All rooms have private bath/toilet, desk / chair, soundproof windows, electronic safe, telephone with possibility for direct dial, flat screen TV with international TV channels, electric kettle with the possibility to make coffee/tea, fan, and free use of Wi-Fi. Single Superior Rooms are approximately 14m2 with a 140 cm wide bed. All rooms overlook HC Andersen’s Boulevard, for those who love to live in the big city. All of the rooms are dedicated to the 50’s and have private bath/toilet, desk / chair, soundproof windows, electronic safe, telephone with possibility for direct dial, flat screen TV with international TV channels, electric kettle with the possibility to make coffee/tea, fan, and free use of Wi-Fi. 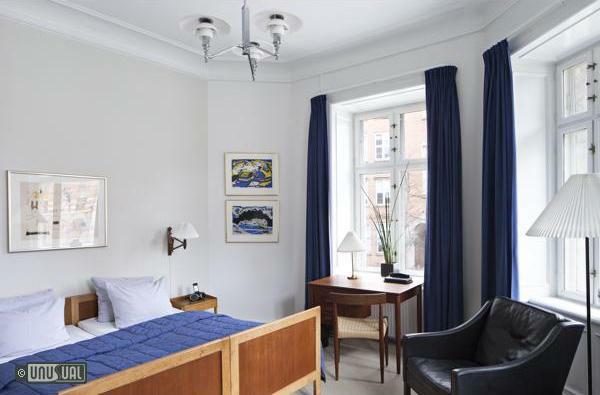 Danish Retro Rooms are approximately 15-16m2 with a double wide bed and the room either overlook the Boulevard (H C Andersens Boulevard) or the side street (Studiestræde). They're either dedicated to the 50’s or to the 60’s. All rooms have private bath/toilet, desk / chair, soundproof windows, electronic safe, telephone with possibility for direct dial, flat screen TV with international TV channels, electric kettle with the possibility to make coffee/tea, fan, and free use of Wi-Fi. 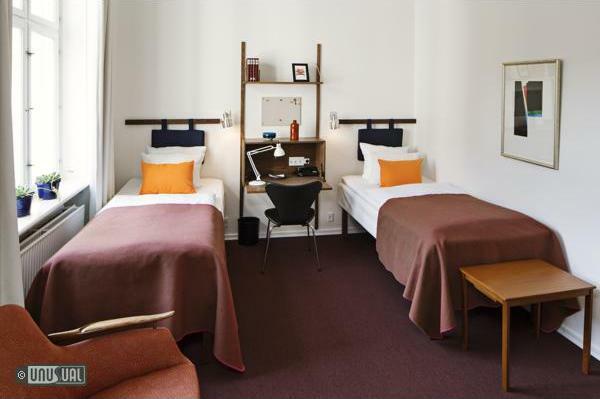 Danish Retro Rooms are approximately 15-16m2 with separated twin beds. The twin rooms are either facing the side street (Studiestræde) or the courtyard. The rooms are either dedicated to the 50’s or to the 60’s. All rooms have private bath/toilet, desk / chair, soundproof windows, electronic safe, telephone with possibility for direct dial, flat screen TV with international TV channels, electric kettle with the possibility to make coffee/tea, fan, and free use of Wi-Fi. 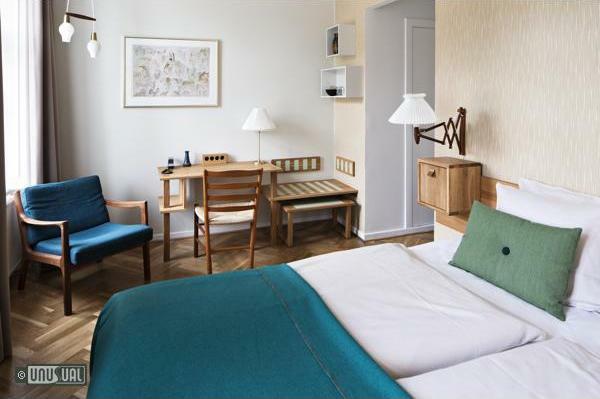 Danish Superior Retro Rooms are approximately 16-17m2. with double mattresses, 160-180 cm wide. 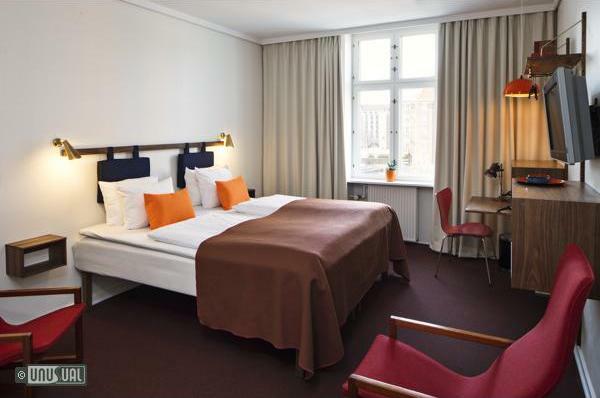 The Superior Double Rooms are overlook the boulevard (H C Andersens Boulevard) or the courtyard, and they are decorated and either a 50’s style or 60’s style. All Rooms have private bath / toilet, desk / chair, soundproof windows, electronic safe, telephone with possibility for direct dial, flat screen TV with international TV channels, electric kettle with the possibility to make coffee/tea, fan, iPhone/iPod docking station with speaker, and free use of Wi-Fi in room. Classic Danish Design Rooms are approximately 25m2 and proposed for 1 or 2 people with 2 single beds put together for a double bed. A few rooms have the possibility for one or two rollaway beds. 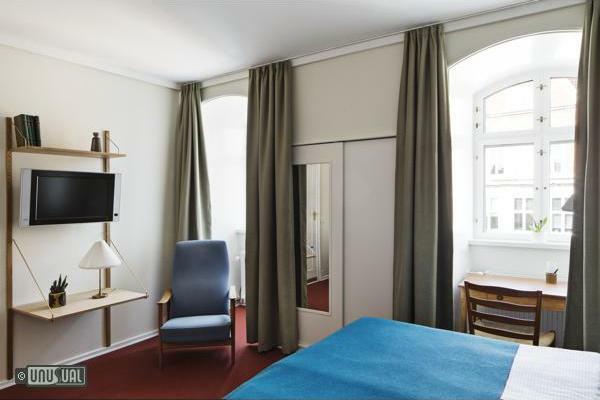 The rooms either overlook the HC Andersens Boulevard or the side street (Studiestræde). 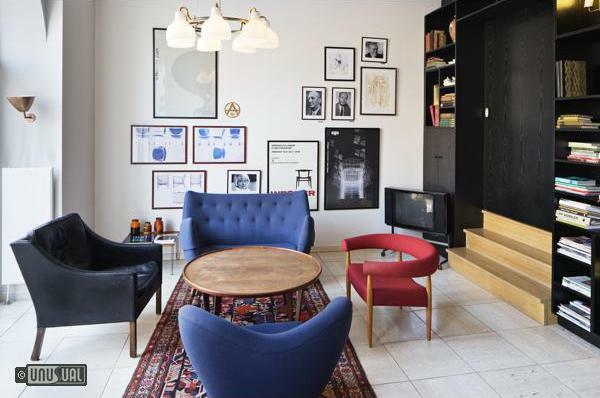 They are all decorated as a tribute to one of the world famous Danish furniture designers; Finn Juhl, Hans J. Wegner, Arne Jacobsen, Ole Wanscher, Nanna Ditzel, Kaare Klint, Børge Mogensen. These rooms are recommended for those who love Danish furniture or want to experience it! Rooms have private bath / toilet, desk / chair, soundproof windows, electronic safe, telephone with possibility for direct dial, flat screen TV with international TV channels, electric kettle with the possibility to make coffee/tea, fan, iPhone/pod docking station with speaker, and free use of Wi-Fi in room. 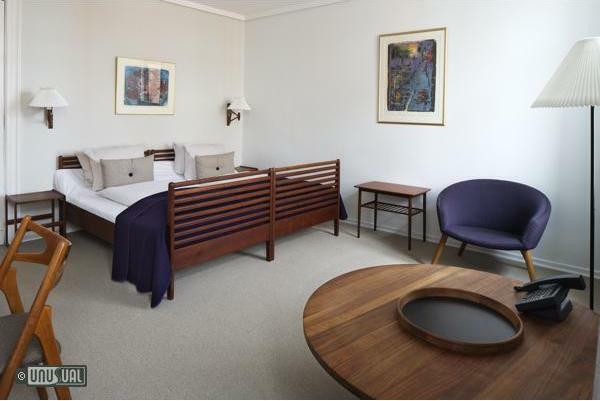 The Finn Juhl Suite is approximately 35m2 and is intended for 1 or 2 people, and has the option for two pull-out beds. The suite is room divided with one bedroom and one living room. 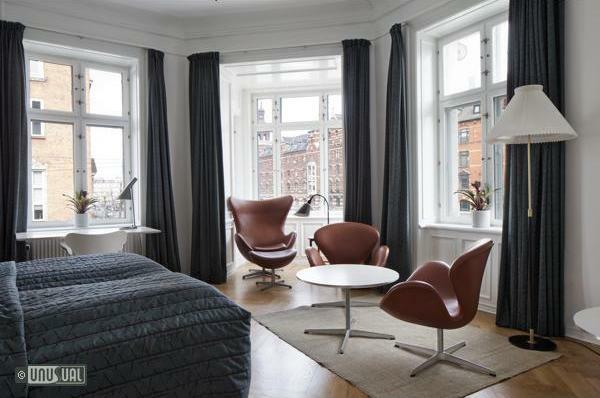 The bedroom in the suite is overlooking the courtyard and the living rooms is facing the side street (Studiestræde). The suite is furnished as a tribute to Finn Juhl, who was one of the most significant, world-renowned, Danish furniture designers. 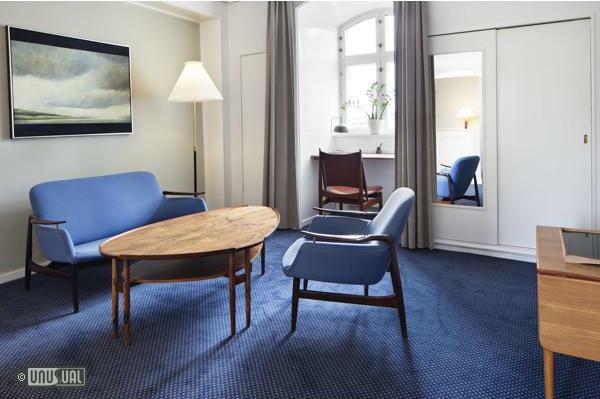 Finn Juhl suite is recommended to those who want plenty of space and love Danish furniture or want to experience it! The room has a private bathroom with a shower, two sinks and a toilet, desk and chairs/sofa, soundproof windows, electronic safe, telephone with possibility for direct dial, flat screen TV with international TV channels in bedroom and living room, electric kettle with the possibility to make coffee/tea, fan, iPhone/iPod docking station with speaker, and free use of Wi-Fi. 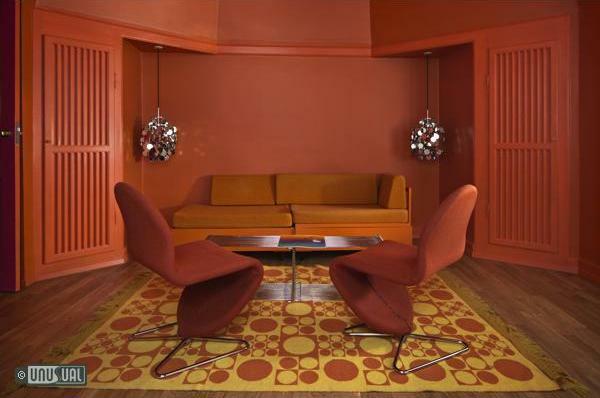 The Verner Panton Suite is approximately 35m2 and divided into one bedroom and one living room. The suite overlooks H.C. Andersens Boulevard (main street) and Studiestræde (side street). 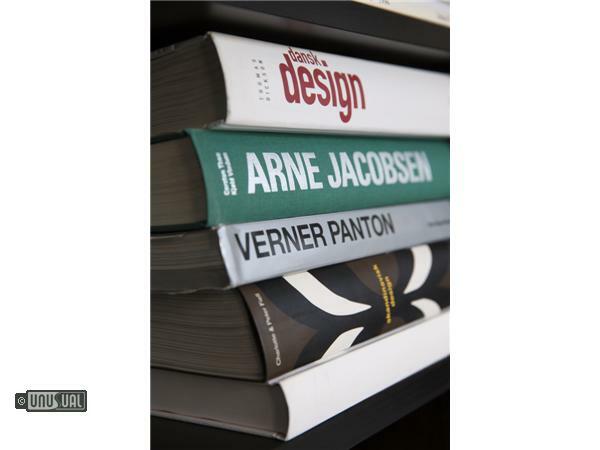 It is furnished as a tribute to Verner Panton, who was one of the most significant world-renowned Danish furniture designers. 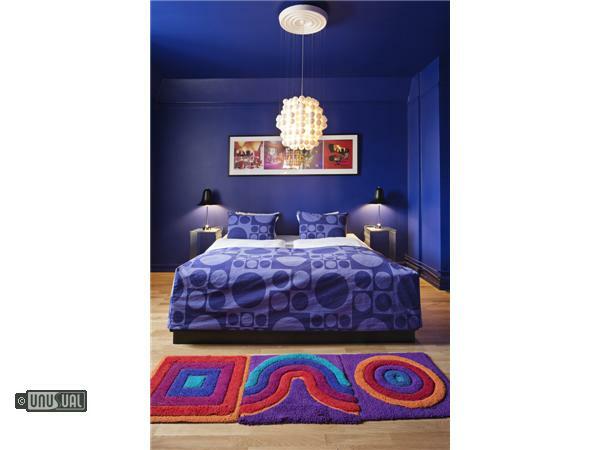 The Verner Panton suite is for those that love colourful living and want to experience Danish furniture art. The Verner Panton suite has private bath with shower/toilet, desk and chairs, soundproof windows, electronic safe, telephone with possibility for direct dial, flat screen TV with international TV channels, electric kettle with the possibility to make coffee/tea, fan, iPhone/iPod docking station with speaker, and free use of Wi-Fi in room. Guests from UHOTW are valued guests to Hotel Alexandra and receive a special discount. All you have to do is to make a booking inquiry using the term "unusual" in the promo box. At Hotel Alexandra you are on the door step to the city center – next to the Latin quarter, inner city and Tivoli Garden. Guests from UHOTW are valued guests to us and are getting special treatment in terms of discount and a gift voucher offers for lunch and dinner. All you have to do is to make an inquiry and write "unusual" in the promo box. In the following guides you will find museums, restaurants, night clubs, shops, flea markets and other fine places were we love to go and believe makes Copenhagen a special spot on earth to live in. It was fun to sleep in a different design era each night! The first night, we were in a large room dedicated to Arne Jacobsen overlooking the avenue: the bay window afforded us an amazing view. The second night we were in a funky 70’s style room strong on orange and Plexiglas, great fun. The third night we were in the Collector’s room, a quiet room with unusual pieces that have been collected and are all for sale. In fact this room changes décor often, based on the pieces that are purchased and the new ones added. Fine décor is well and good, but it is nothing without a friendly staff, and Hotel Alexandra has that totally covered. A special mention has to go out to Eden, who was warm and friendly, always ready with some interesting suggestions when I requested unusual things to see and do in this vibrant city. The general manager Jeppe was so kind and thoughtful, and he has taken so much care to nurture his staff. He told us that Eden, a budding fashion designer, even crafted the Mad Men era staff uniforms. This fact is also noted in the hotel newspaper they leave in the rooms. We had the best stay ever in Copenhagen and the next time we come back, we will definitely “sleep around” again—every room is a new discovery!